Russian pilot cosmonaut 1960-1970. Second person in orbit. Youngest person in space. Left cosmonaut team for brilliant career in the space forces after deciding his future spaceflight prospects were nil. Status: Deceased; Active 1960-1970. Born: 1935-09-11. Died: 2000-09-20. Spaceflights: 1 . Total time in space: 1.05 days. Birth Place: Verhnee Zhilino, Altay. Call sign: Oryel (Eagle). Second human in orbit. Titov completed military aviation training in 1957 and served as an Air Force pilot in the Second Leningrad Aviation Region. In 1960 he was selected in the first cosmonaut group and became the second man to orbit the earth in a one day flight in 1961. His boyish good looks and buoyant personality made him a worldwide heart throb after his flight. He liked women, drink, and fast cars, and took full advantage of his celebrity. This resulted in constant trouble with his chain of command over an endless succession of incidents with women and drunk-driving accidents. With the other flown cosmonauts he entered the Zhukovskiy Air Force Engineering Academy in 1962 for formal training as an engineering test pilot. During this period he headed the cosmonaut team training for flight of the Spiral spaceplane. He graduated from Zhukovskiy in 1968 but the chances for future spaceflights seemed slim. He had suffered space sickness on his first flight. This was later found to be common, but in the 1960's it was held against him. Furthermore it was clear that the Spiral was a dead-end program that would never fly. Therefore he consciously selected a management career in the Soviet space forces. He graduated from the General Staff Military Academy and was appointed Deputy Chief of the Space Command and Control units in August 1972. From June 1973 he was First Deputy Chief of GUKOS for Research, and First Deputy Commander of GUKOS from 1979 to 1991. In these positions he played a key role in the testing and qualification of numerous military space systems. 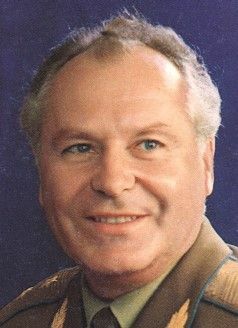 Titov retired from the military in October 1992. Died in Moscow, Russian Federation. Family: Cosmonaut. Country: Russia. Spacecraft: Vostok. Flights: Vostok 1, Vostok 2. Agency: VVS. Bibliography: 6114. 1935 September 11 - . Birth of Gherman Stepanovich Titov - . Nation: Russia. Related Persons: Titov. Russian pilot cosmonaut 1960-1970. Second person in orbit. Youngest person in space. Left cosmonaut team for brilliant career in the space forces after deciding his future spaceflight prospects were nil. 1 spaceflight, 1.1 days in space. Flew to orbit on Vostok 2 (1961). 1961 January 6 - . Cosmonaut crew selections - . Nation: Russia. Related Persons: Bykovsky, Gagarin, Nelyubov, Nikolayev, Popovich, Titov. Flight: Vostok 1. Six of the 20 cosmonauts have been selected by the VVS for final examinations and assignment to Vostok flight crews - Bykovsky, Nikolayev, Popovich, Gagarin, Nelyubov, Titov. The exams are set for 17-18 January..
1961 January 17 - . Cosmonaut examinations - . Nation: Russia. Related Persons: Bykovsky, Gagarin, Nelyubov, Nikolayev, Popovich, Titov. Flight: Vostok 1. The Examination Commission consists of members from the VVS Air Force , AN Academy of Science, industry, and LII Flight Test Institute. The sessions are filmed. Each cosmonaut sits in a Vostok mock-up for 40 to 50 minutes and describes the equipment and the operations to be conducted in each phase of flight. Special emphasis is given in the examiners' questions on orientation of the spacecraft for manual retrofire and egress on land or water. For this phase, Gagarin, Titov, Nikolayev, and Popovich are rated 'outstanding' and Nelyubov and Bykovsky 'good'. 1961 January 18 - . The essay portion of the written examination consists of three questions, with the essay replies to be written out in 20 minutes. After handing in the essay, each cosmonaut is given three to five multiple choice questions. All six pass and are rated as ready to fly the Vostok 3KA. But which of the six is best suited to be the first man in space (at least publicly - one Vostok flight in 1960 would have resulted in the death of the cosmonaut). Gagarin, Titov, and Nelyubov are in the top echelon. Nikolayev is the quietest of the six. Bykovsky is less so, especially in internal meetings, but he says nothing important and doesn't contribute anything substantial. Popovich is a puzzle, his behaviour perhaps influenced by secret family problems. 1961 March 15 - . IAKM Tour - . Nation: Russia. Related Persons: Agaltsov, Alekseyev, Semyon, Gagarin, Nelyubov, Titov, Vershinin. Program: Vostok. Flight: Vostok 1. Spacecraft: Sokol SK-1, Vostok. Chief of Staff F A Agaltsov visits the Institute of Aviation and Space Medicine (IAKM) to review the six cosmonauts' training for flight. An 11-day trial is underway of the hot mock-up of the Vostok capsule's environmental control system. He also sees the dogs that have flown in space: Belka, Strelka, and Chernushka. Strelka has six 3-month-old puppies. Vershinin delivers a speech asking the cosmonauts to be morally prepared for spaceflight. The cosmonauts complain about the performance of Alekseyev's design bureau - of six spacesuits ordered, only three have been delivered (for Gagarin, Titov, and Nelyubov), and they haven't been able to train in parachute jumping in the suits yet. 1961 March 16 - . Kuibyshev - . Nation: Russia. Related Persons: Bykovsky, Gagarin, Karpov, Nelyubov, Nikolayev, Popovich, Titov, Yazdovskiy. Program: Vostok. Flight: Vostok 1. The VVS contingent departs for Tyuratam in three Il-14's. The two with cosmonauts aboard stop at Kuibyshev to give the pilots a look at the recovery zone. Aboard the first aircraft are Kamanin, Gagarin, Nelyubov, and Popovich. Aboard the other are Titov, Bykovsky, and Nikolayev. At the VVS Sanatorium at Privolzhskiy on the Volga the cosmonauts relax, and play ping-pong, chess, and billiards. The cosmonauts, Kamanin, Yazdovskiy, and Karpov sleep together in a single large room. Kamanin finds it a lively group; only Gagarin is pale and quieter than the others. On 7 March his wife had their second daughter and only yesterday he brought them back from the hospital. It was tough on him to then have to leave them on his dangerous secret mission - to be the first man into space. 1961 March 17 - . Tyuratam - . Nation: Russia. Related Persons: Bykovsky, Gagarin, Keldysh, Korolev, Nelyubov, Nikolayev, Popovich, Titov. Program: Vostok. Flight: Vostok 1. Spacecraft: Vostok. The cosmonauts play chess and cards on the flight to Tyuratam. At the airfield, Korolev, Keldysh, and five film cameramen await the cosmonauts. Korolev and Keldysh warmly greet the cosmonauts, but categorically refuse to be filmed. Korolev asks each cosmonaut one or two technical questions. All are correctly answered. Korolev says he wants to ensure that each one of them is 'ready to fly today'. As of now, six Vostoks have been launched, of which four reached orbit, and two landed successfully (one of these albeit after an emergency separation from the third stage on a suborbital trajectory). Two have been unsuccessful, including one on-pad failure on 28 July 1960. Two hours after arrival the cosmonauts go to the MIK assembly hall to familiarise themselves with the launch vehicle and spacecraft. At 14:00 Kamanin meets with the cosmonauts to review the 'Cosmonaut's Manual'. They make several suggestions. They do not feel it is necessary to loosen the parachute harness during the one-orbit flight. They note that the gloves are tried on only 15 minutes before the launch, and not on the closing of the hatch as indicated by Alekseyev. They recommend that a shortened version of the manual should be on board the spacecraft for use in case of a manual re-entry. Communications will be mainly using the laryngeal microphone Incidents will be recorded in the ship's log. The cosmonauts should be able to manually activate the reserve parachute. Kamanin agrees with the latter, but there is no time to change it for the first flight. 1961 March 19 - . Vostok launch delay - . Nation: Russia. Related Persons: Feoktistov, Gagarin, Gusev, Karpov, Nelyubov, Titov, Yazdovskiy. Program: Vostok. Flight: Vostok 1. Spacecraft: Vostok. The launch has been delayed to 24-25 March due to problems with L I Gusev's radio system aboard the spacecraft. A meeting of the cosmonauts at 10:00 reviews landing contingency plans that will bring the capsule down on the territory of the USSR. The best chances for such a landing are on orbits 1, 2, and 16, but it is also possible on orbits 4, 5, 6, and 7. A map will be aboard the capsule to show where and when to ignite the TDU retrorocket for each landing opportunity. Feoktistov was a great help in developing this visual aid. For about an hour Kamanin, Korolev, Yazdovskiy, Karpov, and Azbiyevich discuss long-range plans. Korolev is interested in the VVS position that they should be responsible for all military space activities. The reconnaissance satellite version of Vostok is discussed. Korolev says he plans to send a cosmonaut to the moon by 1965. Afterwards the cosmonauts develop the radio communications plan for the flight. During the 710-second ascent to orbit, and after landing, they are to use the UHF radio. The HF and UHF radios can be used from orbit, but only over the USSR. Plans for filming the cosmonaut in flight are also discussed. 1961 March 20 - . Cosmonauts train in suits - . Nation: Russia. Related Persons: Gagarin, Nelyubov, Rudnev, Titov, Ustinov. Program: Vostok. Flight: Vostok 1. Spacecraft: Sokol SK-1, Vostok. The cosmonauts practice donning the suits and adjusting the regulators. Kamanin muses on the need to convince the VVS leadership to support the TTZ for a new manned spacecraft, on the way to better organize the IP tracking stations, and how to obtain a leading role for the VVS in development of reconnaissance satellites. Otherwise, he believes the Russians will lose the space race to the Americans, who are launching 3 to 4 times more satellites. He notes that 22 Discoverers have been launched to develop an American reconnaissance satellite, and he comments on the Echo-1 passive communications balloon. The Americans are pushing to match the Soviet Union in launch vehicles and already surpass them in electronics, communications, and telemetry. Kamanin notes that communications with Venera 1 were lost when it was only 2 million kilometres from earth, while the US has already demonstrated communications with satellites out to 37 million kilometres. He admires the way the Americans have concentrated all of their efforts in one civilian space organization, with full-time managers for the effort. By comparison, the Soviets only have part-time managers, such as Ustinov, Rudnev, and so on. After the suit exercise the cosmonauts play chess and cards, but again Gagarin does not take part, and is deep in silent thought. 1961 March 21 - . Spring at Tyuratam - . Nation: Russia. Related Persons: Gagarin, Nelyubov, Titov. Program: Vostok. Flight: Vostok 1. Spacecraft: Sokol SK-1, Vostok. It is a beautiful day. The cosmonauts discuss contingencies in case of a water landing. In fact their chances are slim. There are only two Soviet ships equipped with HF and UHF direction-finding equipment that could locate them. The NAZ ejection seat is not designed to float, and the spherical re-entry capsule is no better. Therefore the only option is a landing on the territory of the Soviet Union. In the evening Gagarin, Titov, and Nelyubov practice at the MIK - donning their suits, landing in the spacecraft cabin if that is necessary, getting out of the suit, communications operations, and so on. They are able to get the suit on in 20 minutes, and get it off in 15 minutes. Many space centre workers come to watch the exercises. 1961 March 22 - . LV Family: R-7. Launch Vehicle: Vostok 8K72K. Flight preparations - . Nation: Russia. Related Persons: Barmin, Gagarin, Keldysh, Korolev, Nelyubov, Titov. Program: Vostok. Flight: Vostok 1. Between 10:00 and 12:00 Chief Designer of Launch Facilities Barmin meets with the cosmonauts. He reviews the launch mechanism. The rocket is suspended at the 'shoulders' of the strap-ons, on four swivelled supports. After the rocket has lifted 49 mm, it is free from these, and counterweights weighing dozens of tonnes will swing them back and away from the rising booster. At 12:00 Kamanin meets with Keldysh and Korolev. They agree with his position that the flight be announced as soon as the cosmonaut is safely in orbit. 1961 March 23 - . Cosmonaut Bondarenko dies at age of 24. - . Nation: Russia. Related Persons: Bondarenko, Gagarin, Nelyubov, Titov. Program: Vostok. Flight: Vostok 1. Spacecraft: Vostok. At Tyuratam in the morning, LII engineers brief the cosmonauts on correcting the Globus instrument in flight, which indicates their position over the earth. Korolev checks in for a few minutes to make sure the cosmonauts have everything they need. In the evening the news of the death of cosmonaut Bondarenko reaches the cosmodrome. He died on the tenth day of a 15-day endurance experiment in a pressure chamber at IAKM when a fire broke out in the pure-oxygen cabin. Kamanin blames his death on IAKM's poor organisation and control of the experiment. 1961 March 25 - . Vostok rollout - . Nation: Russia. Related Persons: Alekseyev, Semyon, Gagarin, Rudnev, Titov, Ustinov, Voronin. Program: Vostok. Flight: Vostok 1. Spacecraft: Vostok. At 08:54 a meeting is held, where it is decided the bad performance of Voronin and Alekseyev in completing their capsule subsystems will be reported to Ustinov and Rudnev. At 13:00 the booster is rolled out to the pad. At 18:00 Gagarin and Titov donn their space suits and practice riding the elevator up to the spacecraft, and entering the hatch. This is to give them a practical feel for the time it will actually take them to get aboard and complete checkout of the spacecraft and suit. 1961 March 25 - . 05:54 GMT - . Launch Site: Baikonur. Launch Complex: Baikonur LC1. LV Family: R-7. Launch Vehicle: Vostok 8K72K. Korabl-Sputnik 5 - . Payload: Vostok 3KA s/n 2. Mass: 4,695 kg (10,350 lb). Nation: Russia. Related Persons: Bykovsky, Gagarin, Goreglyad, Kamanin, Karpov, Keldysh, Kirillov, Korolev, Nelyubov, Nikolayev, Popovich, Titov, Voskresenskiy, Yazdovskiy. Agency: RVSN. Program: Vostok. Class: Manned. Type: Manned spacecraft. Flight: Vostok 1. Spacecraft: Vostok. Duration: 0.0600 days. Decay Date: 1961-03-25 . USAF Sat Cat: 95 . COSPAR: 1961-Iota-1. Apogee: 175 km (108 mi). Perigee: 175 km (108 mi). Inclination: 64.90 deg. Period: 88.00 min. Carried dog Zvezdochka and mannequin Ivan Ivanovich. Ivanovich was again ejected from the capsule and recovered by parachute, and Zvezdochka was successfully recovered with the capsule on March 25, 1961 7:40 GMT. 1961 April 3 - . Vostok first manned spaceflight authorised. - . Nation: Russia. Related Persons: Gagarin, Khrunov, Komarov, Nelyubov, Titov. Program: Vostok. Flight: Vostok 1. Spacecraft: Vostok. The eleven cosmonauts not short-listed for early spaceflights are given a new screening examination. However only Khrunov and Komarov are interviewed before an urgent phone call is received from the General Staff: report at 13:00 with Gagarin, Titov, and Nelyubov, then proceed to a Communist Party meeting at 15:00 for the first flight decision. All concerned again confirm readiness for flight, and again Kamanin passes around his photo album, showing the Vostok's potential for military photoreconnaissance. Kamanin briefs the cosmonauts afterwards on the results of the NAZ ejection seat tests. There have been three successful ejections from the Il-28 aircraft, plus ejections from the re-entry capsule on the ground and from an altitude of 5 km. All tests were successful. The cosmonauts are aware of the remaining problems with the capsule but are confident it is safe for a one-orbit flight. Gagarin says that Parachutist Colonel Nikolai Konstantinovich Nikitin, their instructor, should inspect the cosmonaut's parachute at the pad. The cosmonauts have confidence in him, but he has made problems over the tests at Fedosiya. At 16:00 Korolev calls. The Central Committee has approved the flight. He leaves for Tyuratam for final launch preparations. The cosmonauts' confirmation of readiness for flight was recorded and played back to the committee. The resulitng decree 'On approval for launch of Vostok' provided the final authority to proceed with the first manned spaceflight. 1961 April 4 - . VVS General Staff certifies flight readiness of cosmonauts Gagarin, Titov, and Nelyubov. - . Nation: Russia. Related Persons: Filatyev, Gagarin, Khrushchev, Korolev, Moskalenko, Nelyubov, Rafikov, Titov, Zaikin. Program: Vostok. Flight: Vostok 1. They also, on the basis of the recent examinations and interviews, clear the rest of the cosmonaut trainees for flight except for Rafikov, Filatev, and Zaikin, who passed the examinations but had not yet completed all the tests and training. Moskalenko has given approval for a Soviet film team to go to Tyuratam and film preparations for the flight. At the Presidium meeting Khrushchev had questioned what would be done if the cosmonaut reacted poorly in the first minute of the flight. Korolev answered in his deep voice: 'Cosmonaut are extraordinarily trained, they know the spacecraft and flight conditions better than I and we are confident of their strength'. The flight is still seen as very risky - of seven Vostoks flown unmanned so far, five made it to orbit, three landed safely, but one did not. On the other hand, both recent Venera launch attempts reached low earth orbit. 1961 April 5 - . Tyuratam - . Nation: Russia. Related Persons: Gagarin, Gallay, Goreglyad, Korolev, Nelyubov, Titov. Program: Vostok. Flight: Vostok 1. Kamanin departs for the airport in the morning after a good breakfast. There was a fresh snowfall overnight, and Moscow looks beautiful. Three Il-14's wait to shuttle the six cosmonauts and other VVS staff to the launch centre. Gagarin and Nelyubov will fly in Kamanin's aircraft, and Titov and the others in General Goreglyad's. The third aircraft will carry the physicians and film team. The aircraft depart at fifteen-minute intervals, and the entire flight is in beautiful weather. Kamanin's Il-14 lands at Tyuratam at 14:30. Korolev, Gallay, and officers of the staff of the cosmodrome are there to greet them. Korolev requests additional last-minute training for the cosmonauts in manual landing of the spacecraft, suit donning, and communications, but Kamanin refuses. He sees no reason for any training not already agreed in the official plan. Korolev says rollout of the booster is planned for 8 April, followed by launch on 10 or 11 April. Everyone wants to know first - Gagarin or Titov? But Kamanin has not made a final decision yet. Gagarin shows hesitancy in accepting the automatic parachute deployment on the first flight, and only reluctantly agrees to the compromise solution. Titov is a stronger character, better able to hold up during a long duration mission, such as the one-day flight planned for the second mission. But the first into space will be the object of all of the attention from the news media and public. There is not a day that goes by that Kamanin does not think through the issue, without reaching a final conclusion. In the evening the cosmonauts go to the theatre, but the projectionist refuses to run the planned movie on orders of the base commander. 1961 April 6 - . Vostok 1 State Commission - . Nation: Russia. Related Persons: Alekseyev, Semyon, Gagarin, Keldysh, Korolev, Rudnev, Titov. Program: Vostok. Flight: Vostok 1. Spacecraft: Vostok. Rudnev arrives at the cosmondrome, and the first state commission meeting is held with Korolev and the technicians at 11:30. The oxygen regenerator is still not ready, and it is decided to fly with the old dehumidifier on the first flight, since only a 90 minute mission is planned anyway. The suit and all recovery systems worked perfectly on the 9 and 25 March mannequin flights, so the NAZ system is deemed ready for flight. After the meeting Rudnev and Makarov of the KGB go to work on the written orders that will be binding on the cosmonauts in case of accidental landing on foreign territory. Kamanin, Keldysh, and Korolev draw up the final draft of the announcements to be issued in case of normal orbital insertion and after successful landing. In the evening Gagarin and Titov try on their individual suits and Alekseyev checks the parachute systems. The cosmonauts return to the hotel at 11 pm. 1961 April 7 - . Vostok 1 preparations - . Nation: Russia. Related Persons: Gagarin, Moskalenko, Rudnev, Titov, Vershinin. Program: Vostok. Flight: Vostok 1. 1961 April 8 - . Vostok 1 State Commission - . Nation: Russia. Related Persons: Gagarin, Keldysh, Korolev, Moskalenko, Titov, Yazdovskiy. Program: Vostok. Flight: Vostok 1. Spacecraft: Vostok. Rudnev chairs the meeting, in which Kamanin recommends that Gagarin pilot the first manned spaceflight, with Titov as backup. A discussion follows on whether to have a representative from the FAI at the launch in order to obtain registration of the world record. Marshal Moskalenko and Keldysh are opposed - they don't want anyone from outside at the secret cosmodrome. It is decided to enclose the code to unlock the controls of the spacecraft in a special packet. Gagarin will have to break it open in order to get the code that will allow him to override the automatic system and orient the spacecraft manually for re-entry. An emergency ejection during ascent to orbit is discussed. It is decided that only Korolev or Kamanin will be allowed to manually command an ejection in the first 40 seconds of flight. After that, the process will be automatic. There is embarrassment when Moskalenko confronts Yazdovskiy: 'so why are you here, when you're a veterinarian and only handle dogs?' Kamanin has to explain that Yazdovskiy is actually a medical doctor. After the meeting, Kamanin reviews Titov's training in the spacecraft, which has gone well. 1961 April 9 - . Vostok preparations - . Nation: Russia. Related Persons: Gagarin, Moskalenko, Rudnev, Titov. Program: Vostok. Flight: Vostok 1. It is a pleasant spring day at Area 10. The cosmonauts play sports, games, and chess. Rudnev and Moskalaneko think the launch will not realistically happen until 14-15 April. Kamanin informs Gagarin and Titov of the selection of Gagarin to be the first man in space. 1961 April 10 - . Vostok preparations - . Nation: Russia. Related Persons: Bykovsky, Gagarin, Korolev, Moskalenko, Nelyubov, Nikolayev, Popovich, Rudnev, Titov. Program: Vostok. Flight: Vostok 1. Spacecraft Bus: Soyuz. Spacecraft: Sever. Kamanin plays badminton with Gagarin, Titov, and Nelyubov, winning 16 to 5. At 12:00 a meeting is held with the cosmonauts at the Syr Darya River. Rudnev, Moskalenko, and Korolev informally discuss plans with Gagarin, Titov, Nelyubov, Popovich, Nikolayev, and Bykovsky. Korolev addresses the group, saying that it is only four years since the Soviet Union put the first satellite into orbit, and here they are about to put a man into space. The six cosmonauts here are all ready and qualified for the first flight. Although Gagarin has been selected for this flight, the others will follow soon - in this year production of ten Vostok spacecraft will be completed, and in future years it will be replaced by the two or three-place Sever spacecraft. The place of these cosmonauts here does not indicate the completion of our work, says Korolev, but rather the beginning of a long line of Soviet spacecraft. Korolev predicts that the flight will be completed safely, and he wishes Yuri Alekseyevich success. Kamanin and Moskalenko follow with their speeches. In the evening the final State Commission meeting is held. Launch is set for 12 April and the selection of Gagarin for the flight is ratified. The proceedings are recorded for posterity on film and tape. Vostok 1 - . Call Sign: Kedr (Cedar ). Crew: Gagarin. Backup Crew: Nelyubov, Titov. Payload: Vostok 3KA s/n 3. Mass: 4,725 kg (10,416 lb). Nation: Russia. Related Persons: Karpov, Keldysh, Korolev, Moskalenko, Rudnev. Agency: RVSN. Program: Vostok. Class: Manned. Type: Manned spacecraft. Flight: Vostok 1. Spacecraft: Vostok. Duration: 0.0750 days. Decay Date: 1961-04-12 . USAF Sat Cat: 103 . COSPAR: 1961-Mu-1. Apogee: 315 km (195 mi). Perigee: 169 km (105 mi). Inclination: 65.00 deg. Period: 89.30 min. 1961 August 6 - . 06:00 GMT - . Launch Site: Baikonur. Launch Complex: Baikonur LC1. LV Family: R-7. Launch Vehicle: Vostok 8K72K. Vostok 2 - . Call Sign: Oryel (Eagle ). Crew: Titov. Backup Crew: Nelyubov, Nikolayev. Payload: Vostok 3KA s/n 4. Mass: 4,730 kg (10,420 lb). Nation: Russia. Agency: RVSN. Program: Vostok. Class: Manned. Type: Manned spacecraft. Flight: Vostok 2. Spacecraft: Vostok. Duration: 1.00 days. Decay Date: 1961-08-07 . USAF Sat Cat: 168 . COSPAR: 1961-Tau-1. Apogee: 221 km (137 mi). Perigee: 172 km (106 mi). Inclination: 64.80 deg. Period: 88.40 min. Second manned orbital flight. The Soviet Union successfully launched Vostok II into orbit with Gherman S. Titov as pilot. The spacecraft carried life-support equipment, radio and television for monitoring the condition of the cosmonaut, tape recorder, telemetry system, biological experiments, and automatic and manual control equipment. Flight objectives: Investigation of the effects on the human organism of a prolonged flight in orbit and subsequent return to the surface of the Earth; investigation of man's ability to work during a prolonged period of weightlessness. Titov took manual control of spacecraft but suffered from space sickness. He was equipped with a professional quality Konvas movie camera, with which ten minutes of film of the earth were taken through the porthole. Both television and film images were taken of the interior of the spacecraft. Like Gagarin, Titov experienced problems with separation of the service module after retrofire. Titov was never to fly again, after being assigned to the Spiral spaceplane, which turned out to be a dead-end project. A biography of him by Martin Caidin ('I Am Eagle') made him somewhat more accessible than Gagarin to the West. 1961 August 7 - . Landing of Vostok 2 - . Return Crew: Titov. Nation: Russia. Related Persons: Titov. Program: Vostok. Flight: Vostok 2. After 17.5 orbits, the spacecraft reentered on August 7 and landed safely at 7:18 GMT near Krasny Kut, Saratov. Titov made a separate parachute landing after riding his ejection seat out of the capsule..
Cosmonauts in the Crimea - . Nation: Russia. Related Persons: Gagarin, Titov. During a trip to Crimea that began on 14 September, Kamanin finds that Gagarin and Titov have been showing bad behaviour, drinking too much, and insulting others..
1961 October 17 - . Titov at Party Conference - . Nation: Russia. Related Persons: Gagarin, Khrushchev, Titov. Titov attends in place of Gagarin. Kamanin's cover story is that Gagarin is in the hospital, suffering from exhaustion, and that he will confined to bed until 25 October. Everyone, from Khrushchev on down, is unhappy with this. Kamanin's enemies are using the situation to criticize VVS participation in the space program in general, and Kamanin personally. Without Gagarin, Titov is not seated in the Presidium, and the VVS loses an important lever of influence at the meeting. 1961 October 18 - . Vostok 3 training - . Nation: Russia. Related Persons: Nikolayev, Titov. Program: Vostok. Flight: Vostok 3. Spacecraft: Sokol SK-1, Vostok. Nikolayev conducts a three-day simulated spaceflight in his suit, in the spacecraft, including centrifuge runs at the beginning and end. Kamanin is furious about Titov's antics in Rumania, where he rode a motorcycle in a parade!. 1961 November 14 - . Cosmonaut self-criticism - . Nation: Russia. Related Persons: Gagarin, Titov. Gagarin and Titov are criticised for their high living and consorting with loose women and prostitutes while in the Crimea and on the road. Gagarin is also brought to task for the ridiculous story he made up as to why his wife found him in the nurse's bedroom. Gagarin receives his FAI Medal at a public ceremony. The press asks where he got the scar on his face. He tells them that he was hit by a stone while playing with his daughter. 1962 January 27 - . Titov returns from tour - . Nation: Russia. Related Persons: Gagarin, Titov. He has visited Indonesia and Burma. Tomorrow Gagarin leaves on a tour of Africa. There has been an 'incident' between Titov and his chauffeur Pomerantesva. She was born in 1918, has a child and is a good party member. Titov wanted her to drink with him at 2 am in the morning. It is obvious that the role of cosmonauts is much greater than planned - more academic training is needed. Therefore Kamanin decides to split the cosmonauts into two groups. One group will train for space in 1962 while the other goes to university. The groups will switch in the fall of 1963. 1962 February 17 - . Immediate Vostok launches demanded - . Nation: Russia. Related Persons: Nikolayev, Popovich, Titov, Ustinov. Program: Vostok. Flight: Vostok 3, Vostok 4. Ustinov wants launch of two cosmonauts within a month to answer the American Glenn flight. Of seven candidates, Nikolayev and Popovich are most likely to be selected. Meanwhile Titov has more incidents. He has driven his Volga into a bus. This is his third accident within a year. 1962 March 1 - . Plans for astronaut/cosmonaut meeting - . Nation: Russia. Related Persons: Gagarin, Glenn, Titov. Glenn is in Washington, and meets the Secretary General of the United Nations, who mentions a plan of the Soviet ambassador to the UN. Gagarin and Titov might visit New York to address the United Nations on 19 March. This would provide an opportunity for the cosmonauts and US astronauts to meet. 1962 March 5 - . Vostok 3/4 delayed - . Nation: Russia. Related Persons: Bykovsky, Gagarin, Nelyubov, Nikolayev, Popovich, Titov. Program: Vostok. Flight: Vostok 3, Vostok 4. Spacecraft Bus: Vostok. Spacecraft: Zenit-2 satellite. Due to technical problems and the launch failure of a Zenit spy satellite, the launch of the dual Vostoks is pushed back to April. Therefore a trip to New York by the cosmonauts in March will not be possible. In any case the Presidium has decided against allowing them to address the United Nations. 1962 March 8 - . FAI Submission - . Nation: Russia. Related Persons: Titov. Flight: Vostok 2. 1962 March 24 - . Cosmonauts dismissed - . Nation: Russia. Related Persons: Anikeyev, Rafikov, Titov, Vershinin. Vershinin approves the removal of Rafikov and Anikeyev from the cosmonaut group. In the night of 12-13 March they left the base without permission and went to the Moskva Restaurant Rafikov is not happy with his wife, and talks of divorce all the time. During holidays in Sochi last May he spent time with many women, and beat his wife when she complained about it. Titov, Rafikov, and Anikeyev have all come to the notice of the Chief of Staff. 1962 March 27 - . Rafikov dismissed. - . Nation: Russia. Related Persons: Anikeyev, Gagarin, Korolev, Nikolayev, Popovich, Rafikov, Titov. Rafikov is dismissed effective immediately. He says he is sorry, but believes that blame should be shared collectively. He says the escapades of Gagarin and Titov encouraged him and Anikeyev to do the same. He says that his wife and five-year-old son want to stay with him. His pleas are to no avail. Meanwhile the cosmonauts still support limiting the next flights in space to two days, but Korolev is training Nikolayev and Popovich for three days anyway. 1962 April 12 - . First Cosmonautics Day - . Nation: Russia. Related Persons: Titov. Flight: Vostok 3, Vostok 4. The Central Committee has cleared Kamanin and Titov to travel to New York in May. But Kamanin believes they should instead be in Russia at that time for the Vostok 3/4 launches..
1962 April 20 - . Cosmonaut tours - . Nation: Russia. Related Persons: Gagarin, Nikolayev, Popovich, Titov. Titov is now to go to America, while Gagarin is in Austria and Japan. Nikolayev and Bykosvky head for from in-suit parachute training at Fedosiya..
1962 April 23 - . Titov again - . Nation: Russia. Related Persons: Titov. Titov's arrogance knows no bounds, Kamanin fumes. He wants to be included in decision-making sessions, he wants to take his wife with him on the US tour, and he wants his own jet. Meanwhile, the Americans are starting a major H-bomb test campaign in the South Pacific. 1962 April 29 - . Titov in New York - . Nation: Russia. Related Persons: Titov. Kamanin, Titov, and Titov's wife arrive in New York City. They tour the sights, hold a press conference at the United Nations, and see the film 'Flight of a Man to the Moon' at Radio City Music Hall. The people in the city seem to swarm like ants to Kamanin. He notes they received great applause at the UN. 1962 May 2 - . Titov in Washington - . Nation: Russia. Related Persons: Titov. Kamanin and Titov are greeted by Ambassador Dobrynin (who Kamanin notes graduated from the Moscow Aviation Institute and worked as an engineer at Yakovlev's design bureau)..
1962 May 6 - . Titov at Seattle World Fair - . Nation: Russia. Related Persons: Titov. Spacecraft: Mercury. Kamanin and Titov visit the space exhibit at the US pavilion, including Glenn's Mercury capsule. Kamanin proudly notes that the fair had 75,000 visitors on the day the cosmonaut was there, compared to 25,000 to 27,000 on an average day..
1962 May 7 - . Titov sick - . Nation: Russia. Related Persons: Titov. Kamanin and Titov arrive in San Francisco, but Titov is taken ill. .
1962 May 9 - . Titov interview with Seventeen magazine - . Nation: Russia. Related Persons: Titov. Titov, the teen idol, back in New York, gives an exclusive interview to the teenybopper rag..
1962 May 10 - . Titov in New Jersey - . Nation: Russia. Related Persons: Titov. Kamanin and Titov tour a Ford automobile factory in New Jersey. Kamanin notices two students standing outside with a placard: 'Titov - Yes! USSR - No!'. 1962 May 12 - . Titov heads home - . Nation: Russia. Related Persons: Titov. Kamanin and Titov return to the Soviet Union on the route Halifax-Gander-Prestwick-Moscow. Kamanin notes with satisfaction that on their 12-day tour Titov held 20 press conferences and delivered eight speeches. Most importantly, he managed to give excellent and politically acceptable replies to all of the reporters' questions. Zenit booster failure damages pad, delays Vostok 3/4 - . Nation: Russia. Related Persons: Gagarin, Keldysh, Korolev, Titov, Vershinin. Program: Vostok. Flight: Vostok 3, Vostok 4. Spacecraft Bus: Vostok. Spacecraft: Zenit-2 satellite. A briefing by engineer V A Smirnov predicts that the Americans will make a 17-18 revolution flight of the earth by the end of 1962. Kamanin disagrees, believing they will not achieve this until the second half of 1963. Another Zenit-2 spy satellite has failed to achieve orbit. The first had failed due to a third stage problem, and now the third attempt failed due to a first stage problem. It blew up 300 m from the pad, and did enough damage to put the launch complex out of operation for a month. Therefore the Vostok 3/4 launches cannot now take place until the end of July at the earliest. Kamanin has continued arguments over the reorganisation of VVS space units and the role of IAKM. Korolev has never supported a leading role for the VVS or Kamanin in the Soviet space program. He is complaining about the 'offences' of the VVS, Kamanin, and the cosmonauts. Korolev cites Gagarin's trauma and Titov's motor accidents. He believes cosmonauts should be selected only from OKB-1 engineers. He also believes the cosmonauts are wasting too much time on publicity tours. Vershinin and Keldysh are hearing all of these complaints. 1962 July 6 - . Titov again - . Nation: Russia. Related Persons: Titov. Kamanin reports that Titov is driving his Volga all over the country at high speed..
1962 July 14 - . Titov again - . Nation: Russia. Related Persons: Titov. Titov is involved in another automobile accident at 4 am in the morning. Kamanin tries to contact him, but he has gone to Kiev and won't return his calls. .
1962 August 3 - . Titov again - . Nation: Russia. Related Persons: Korolev, Kuznetsova, Ponomaryova, Titov. Program: Vostok. Flight: Vostok 3, Vostok 4. Spacecraft: Vostok. Kamanin learns that Ponomaryova and Kuznetsova spent all night in TItov's apartment at TsPK. 'Dumb girls' he intones. Kamanin travels in a Lvov bus from Area 10 to Area 2, a distance of 40 km. Driving a Volga automobile, the stretch can now be done in only thirty minutes on the newly paved road. Korolev and his engineers are hard at work. Spacecraft number 5 is already in final tests, with Spacecraft 6 one to two days behind it in the processing flow. The launches will be observed by all of the female cosmonauts and 4 to 8 of the new engineer-cosmonauts. 1962 August 17 - . Vostok 3/4 post-flight - . Nation: Russia. Related Persons: Gagarin, Nikolayev, Popovich, Titov. Program: Vostok. Flight: Vostok 3, Vostok 4. The cosmonauts continue their post-flight medical examinations, but everyone is suffering from hangovers from the celebration the night before. There was a stupid incident, with some of the leaders blaming Nikolayev of bad behaviour. Most of the commission leaves in the evening. In the afternoon the new heroes of the cosmos - Gagarin, Titov, Nikolayev, and Popovich - are taken boating, to the acclaim of crowds on the shore. 1963 January 31 - . Smirnov opposed to dual female Vostok flight. - . Nation: Russia. Related Persons: Smirnov, Titov. Program: Vostok. Flight: Vostok 5, Vostok 6, Vostok 6A. Spacecraft: Vostok. Smirnov only wants to fly two, not four Vostoks this year. One male, and one female cosmonaut would be launched in a group flight. Correct approvals cannot be obtained in time for manufacture of four Vostoks until August of this year. Later Kamanin has another scene with Titov. The cosmonaut was drunk on a factory visit, and defied the militia when confronted. 1963 May 4 - . Kamanin informed that a dual spaceflight has been decreed within the next 6 weeks. - . Nation: Russia. Related Persons: Alekseyev, Semyon, Bykovsky, Khrunov, Korolev, Leonov, Tereshkova, Titov, Volynov. Flight: Vostok 5, Vostok 6. Only today is Kamanin informed that a dual flight has been decreed within the next 3 to 6 weeks. The women are ready, but Bykovskiy and Volynov need a few parachute jumps and training in the hot mock-up. Leonov and Khrunov need additional centrifuge training as well. Bykovskiy and Volynov should be ready by 30 May, and Leonov and Khrunov by 15 June. Therefore earliest possible launch date is 5 to 15 June. Alekseyev's bureau is as always the pacing factor. He can adapt one of the female ejection seats for Bykovskiy, but not for Volynov. The space suit for Leonov will only be completed by 30 May. Kamanin talks to Korolev about dumping Alekseyev's bureau in the future. Cosmonaut parachute trainer Nikitin agrees that Bykovskiy can complete his parachute qualification at Fedosiya on 9-10 May. Further bad behaviour by Titov is reported during a trip to Kiev. He insulted an officer ('I am Titov, who are you?') and then had general's wives intervene on his behalf to get him out of trouble. 1963 May 17 - . Problems with Titov again. - . Nation: Russia. Related Persons: Bykovsky, Titov, Volynov. Flight: Vostok 5. Spacecraft Bus: Sokol. Spacecraft: Sokol SK-1. Problems with Titov again. While on a road trip with a journalist, he left a satchel with sensitive and classified papers unattended in his car - documents from Korolev, secret state decrees by the Supreme Soviet, etc. At 12:30 Volynov took Bykovskiy's place in the hot mock-up. Examination of Bykovskiy's suit showed that it had been incorrectly assembled. 1963 June 6 - . Launches of Vostok 5 and 6 delayed - . Nation: Russia. Related Persons: Bykovsky, Titov. Flight: Vostok 5, Vostok 6. Spacecraft: Vostok. Launches of Vostok 5 and 6 are delayed due to failure of the command radio line. There were many such failures during preparation of the spacecraft. It will take three to four days to fix. Kamanin inspects the site for the planned cosmonaut quarters on the Syr Darya river. It is located next to Khrushchev's houses (which he has handed over to Chelomei for quartering his people) and the television centre. The building will face east, with a view of the river and a wooded island. Bykovskiy is run through a first 'practice press conference' to teach him the correct responses to questions. The military officers want to minimise press contacts with the cosmonauts in any case. But the kids in the town are mad about the cosmonauts -- the chanted from 6 to 11 pm in the evening outside their quarters, and Kamanin has seen teenage girls stand in the rain for hours for a chance to see Titov (and he never even came out as promised). First child born to someone who has been in space. - . Nation: Russia. Related Persons: Titov. A daughter is born to Titov. This is the first child born to someone who has been in space. .
1964 January 15 - . Titov's promotion blocked. - . Nation: Russia. Related Persons: Titov. Reorganisation of the TsPK cosmonaut training centre is discussed. Titov's position in the new hierarchy is contested. Kamanin is shown a KGB file on Titov, citing numerous transgressions. There is nothing new in the file..
1964 April 8 - . Press preparations - . Nation: Russia. Related Persons: Bykovsky, Gagarin, Nikolayev, Popovich, Tereshkova, Titov. Kamanin meets with 'The Six' (flown cosmonauts) and prepares them for the onslaught of scheduled appearances and press conferences scheduled for the upcoming Cosmonautics Day (April 12). .
1964 June 27 - . Titov scandal - . Nation: Russia. Related Persons: Titov. Titov is accused of being responsible for a very serious hit-and-run traffic accident. He is cleared of the more serious charges..
1964 July 3 - . Zero gravity effects - . Nation: Russia. Related Persons: Glenn, Shepard, Titov. Kamanin reads an interesting Tass report. An American doctor named Wagner has suggested that balance disorders that afflict Glenn, Shepard, and Titov may have been due to zero gravity. Kamanin says that the report his wrong, that Titov never had such problems after the flight. But he has wondered whether his changed personality - hyperactive, undisciplined, unable to sit still - might be due to some effect of zero gravity. Kamanin calls the VVS Chief Flight Surgeon, Khlebnikov, who advises him that no such effects were seen in any of the cosmonauts after flight, that there was no deviation from their physiological norms. 1964 July 17 - . Titov affair - . Nation: Russia. Related Persons: Titov. Titov's case is heard before the military procurator. He is found not culpable in the death of Fomenkov, but Kamanin finds he is not truthful regarding his movements that day..
Titov interviewed - . Nation: Russia. Related Persons: Korolev, Titov. Program: Voskhod. Flight: Voskhod 2. Spacecraft Bus: Vostok. Spacecraft: Voskhod. 1964 August 17 - . Cosmonauts on tour - . Nation: Russia. Related Persons: Bykovsky, Gagarin, Nikolayev, Popovich, Tereshkova, Titov. Since 14 August most of the cosmonauts have been out of town. Gagarin is in Leningrad, Titov and Bykovsky in Kiev, Popovich in Lipetsk (being trained on the MiG-21), the Voskhod crews in Arkhangelsk. Only Tereshkova and Nikolayev remain in Moscow. Then comes the news that Popovich has injured his leg in a fall on some stairs. The incident came after Popovich picked up two 15-year old girls in his Volga. 1964 November 3 - . Cosmonauts dispersed - . Nation: Russia. Related Persons: Biryuzov, Bykovsky, Feoktistov, Gagarin, Komarov, Nikolayev, Popovich, Tereshkova, Titov, Yegorov. Kamanin receives a phone call from Serbin in the Central Committee, demanding that all nine flown cosmonauts be present at the unveiling of a space obelisk in Moscow the next day, and be on the podium at Red Square on 7 November. This is impossible - the cosmonauts are dispersed on vacation, cure, or public relations missions. Gagarin, Nikolayev, Popovich, and Tereshkova are in Sochi, and after discussion, it seems they will be able to get back by the next day. But Titov and Bykovsky are in Odessa, and it will take them three days to get back. The VVS leadership is contacted to arrange special flights, otherwise all nine could only be gathered by 9-10 November. Kamanin receives the decree creating the new TsUKOS military organisation that will direct Soviet spaceflight. He is sure such a resolution would never have passed had Biryuzov not been killed in the plane crash. The VVS retains only its existing role of cosmonaut training. 1964 November 4 - . Space obelisk unveiling - . Nation: Russia. Related Persons: Brezhnev, Bykovsky, Feoktistov, Gagarin, Komarov, Nikolayev, Popovich, Tereshkova, Titov, Yegorov. 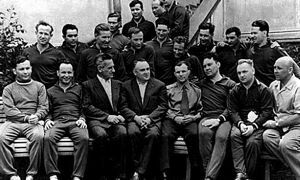 Gagarin, Titov, Nikolayev, Popovich, Tereshkova, and Bykovsky have all managed to make it to Moscow by plane, and they meet at TsPK at 13:00. Kamanin takes the unique opportunity of having them all together to discuss plans for their higher engineering education at the Zhukovskiy Academy, plans for construction of new quarters at the TsPK, and an overview of planned future missions based on recent resolutions. At 14:30 the group departs in four Volga automobiles for Moscow. The unveiling ceremony is at 16:00. Brezhnev, Kosygin, Mikoyan, and other bigwigs are there as well. Cosmonauts tour Leningrad - . Nation: Russia. Related Persons: Belyayev, Gagarin, Glushko, Komarov, Leonov, Titov. Program: Voskhod. Spacecraft Bus: Vostok. Spacecraft: Voskhod. Kamanin, Gagarin, Titov, Komarov, Belyayev, and Leonov began a major public relations tour of Leningrad. With Glushko they visit the Petropavlovsk Fortress, where he conducted the first rocket experiments in 1931. .
1965 June 26 - . Poor progress on space trainers - . Nation: Russia. Related Persons: Dementiev, Smirnov, Titov. Program: Voskhod, Lunar L1. Flight: Soyuz 1, Soyuz 2A, Voskhod 3, Voskhod 4, Voskhod 5, Voskhod 6. Spacecraft: LK-1, Soyuz A, Spiral OS, TMK-1, TMK-E.
Titov and Kamanin visit LII to review the status of simulator construction. The engineers haven't had any time to even consider trainers for winged spacecraft. The Soyuz trainer will only be completed by July 1966, and the trainer for the new Voskhod configuration is still on paper only. Simulators for manned lunar or planetary flights have not even been discussed yet. It is clear that Kamanin is going to have to go up the chain of command to Dementiev and Smirnov to get resources allocated for the work to be accelerated. 1965 July - . Launch Vehicle: Spiral 50-50. Spiral cosmonaut team formed - . Nation: Russia. Related Persons: Dobrovolsky, Filipchenko, Kuklin, Matinchenko, Titov. Spacecraft Bus: Spiral 50-50. Spacecraft: Spiral OS. In 1965 the advanced project of the Mikoyan Spiral aerospace system was approved. The ambitious work plan indicted operation of a regular earth-orbit-earth reusable transportation system by the mid-1970's. With Gherman Titov as its head, a Spiral cosmonaut training group was formed (Titov, Dobrovolskiy, Filipchenko, Kuklin, Matinchenko) to train to fly the spaceplane. 1965 September 2 - . Launch Vehicle: Spiral 50-50. Spiral cosmonaut team changes - . Nation: Russia. Related Persons: Beregovoi, Filipchenko, Kuklin, Shatalov, Titov. Spacecraft Bus: Spiral 50-50. Spacecraft: Spiral OS. The was team now consisted of Titov, Beregovoy, Filipchenko, Kuklin, and Shatalov..
1965 October 22 - . 1965 November 15 - . Gagarin letter impact - . Nation: Russia. Related Persons: Brezhnev, Gagarin, Komarov, Kuznetsov, Nikolai F, Leonov, Nikolayev, Smirnov, Titov. Brezhnev has finally read Gagarin's letter, and forwarded it to Smirnov for a full report. Smirnov in turn has asked the commanders of the military branches to convene a soviet to address the issues raised in the letter. Marshal Sudets meets with cosmonauts Gagarin, Titov, Nikolayev, Komarov, Leonov, as well as Kamanin and Kuznetsov. There is a consensus that a single military branch should handle space - either VSS, PVO, or RVSN - but many are opposed to that branch being the VVS. The consensus is that the mission should be given to the PVO. 1965 November 23 - . Launch Vehicle: Spiral 50-50. Spiral spaceplane - . Nation: Russia. Related Persons: Belyayev, Brezhnev, Filipchenko, Gagarin, Leonov, Matinchenko, Mikoyan, Titov. Spacecraft Bus: Spiral 50-50. Spacecraft: Spiral OS. Gagarin, Belyayev, and Leonov are preparing for a meeting with Brezhnev. Nothing controversial is to be raised. The real issue now is to develop a winged, manned orbital spacecraft, and a winged booster stage for space launches. This will be essential to future manned military activities. Mikoyan's MiG bureau has been working on the orbital spaceplane, and Tupolev the winged booster stage. Titov, Filipchenko, and Matinchenko and a few other cosmonauts will coordinate with Mikoyan on development of the spaceplane design. 1966 January 4 - . Korolev visits Cosmonaut Training Center - . Nation: Russia. Related Persons: Belyayev, Brezhnev, Bykovsky, Gagarin, Komarov, Korolev, Leonov, Nikolayev, Popovich, Tereshkova, Titov. Korolev visits the centre, and spends more than six hours with the cosmonauts. However he says nothing about concrete flight plans. Afterwards Kamanin meets with Gagarin, Titov, Popovvich, Nikolayev, Tereshkova, Bykovsky, Komarov, and Belyayev (Leonov is at courses at the Academy). A profound pessimism prevails. Nothing has come of the letter to Brezhnev. 1966 January 18 - . Korolev buried in Red Square - . Nation: Russia. Related Persons: Brezhnev, Bykovsky, Gagarin, Komarov, Nikolayev, Popovich, Titov. The urn with Korolev's ashes is placed in the Kremlin Wall by an honor guard of cosmonauts and the highest leaders of the state. Kamanin knows that the like of Korolev will not be seen again. There are dozens of Chief Designers, but none with the genius, talent, and drive of Korolev. Kamanin worries for the future in the space race with the Americans. Even in life, Korolev was never able to achieve more than one or two spaceflights per year. Now, in 1966, they are supposed to achieve four times that flight rate without him. 1966 February 1 - . Titov and Spiral - . Nation: Russia. Related Persons: Titov. Spacecraft Bus: Spiral 50-50. Spacecraft: Spiral OS. Titov has really turned himself around. Since being assigned to the Spiral spaceplane project, he has become newly motivated and involved with the project. He has obtained training on the MiG-21, with 120 flight hours per year required in support of the programme. All of this in parallel with academic studies at the Zhukovskiy Academy. 1966 March 29 - . 23rd Party Congress - . Nation: Russia. Related Persons: Belyayev, Bykovsky, Gagarin, Komarov, Leonov, Nikolayev, Popovich, Tereshkova, Titov. Program: Voskhod. All flown cosmonauts have been named as delegates, including Titov, who has objected to being taken away from his MiG-21 training for this..
1966 April 29 - . Cosmonaut travels - . Nation: Russia. Related Persons: Leonov, Popovich, Tereshkova, Titov. Program: Soyuz. Spacecraft Bus: Spiral 50-50. Spacecraft: Spiral OS. Kamanin plans to make Popovich and Titov deputy commanders of cosmonaut detachments preparing for flight of the Soyuz 7K-OK and Spiral spaceplane. Leonov is back from a tour of France; Titov is preparing to go to Afghanistan, and Tereshkova to Armenia. But that night Titov does not come home - he is hanging out again with artists and other unacceptable types. 1967 March 12 - . Spiral and Soyuz training - . Nation: Russia. Related Persons: Nikolayev, Titov. Program: Soyuz. Flight: Soyuz 1, Soyuz 2A. Spacecraft: Soyuz 7K-OK, Spiral OS. Titov in France. - . Nation: Russia. Related Persons: Titov. Titov is on tour in France. Kamanin notes that Titov used to make many mistakes, but has now reformed..
1968 January 19 - . Gagarin and Titov visit Tereshkova in the hospital. - . Nation: Russia. Related Persons: Gagarin, Tereshkova, Titov. In 1967, the average cosmonaut who had already flown in space spent 50 days on public relations activities and tours - a serious loss to them in terms of training for future missions..
1968 April 27 - . Kamanin proposes organising the cosmonauts into two detachments. - . Nation: Russia. Related Persons: Belyayev, Leonov, Matinchenko, Popovich, Titov. Nikolayev is to be commander of the first group, with Leonov as his deputy. Titov would command the second group, with Popovich as his deputy. But Kamanin doesn't consider any of them to be command officer material yet. The automobile accidents of Popovich, the mess that led to Matinchenko's dismissal, the bad performance of Belyayev in his duties as chief of staff of the VVS group at Baikonur - none of these men have any discipline! 1968 April 29 - . Mishin '2+2' scenario for the next manned Soyuz flight. - . Nation: Russia. Related Persons: Mishin, Titov. Program: Soyuz. Spacecraft Bus: Soyuz. Spacecraft: Soyuz 7K-OK.
Mishin calls Kamanin and asks what he would think of a revised scenario for the next manned Soyuz flight. Mishin's '2+2' concept would call for four, instead of five cosmonauts, aboard two Soyuz capsules with transfer of only one cosmonaut by EVA. He gives Kamanin until 6 May to give his opinion on the change of plan. Titov is planning on selling his Volga automobile and buying a Moskovich. 1968 May 11 - . Cosmonaut jet trainers. - . Nation: Russia. Related Persons: Belyayev, Bykovsky, Kuznetsov, Nikolai F, Leonov, Nikolayev, Popovich, Titov. Holidays - in the first ten days of May, the civilians work only two days, while the military must work four. Kamanin assigns cosmonauts to the State Commission that will select the design for the Gagarin memorial obelisk. He then reviews cosmonaut pilot aircraft type qualifications. Titov is current on the Su-7, MiG-21, and several other high-performance aircraft. Nikolayev and Leonov are still certified to fly two or three MiG fighter types. Belyayev, Bykovsky, Popovich, Kutachov, and the others are only current on the L-29 trainer. The L-29 is 20 times more reliable than the MiG-21 or Su-7, and the MiG-15 trainer is 4x to 5x more reliable than the high performance types. In general the cosmonauts are against plans to move the air regiment to TsPK from Chkalovsky air field due to greater air space restrictions over Moscow. 1968 May 22 - . Mishin pushes for '1+2' Soyuz mission - . Nation: Russia. Related Persons: Khrunov, Mishin, Titov. Program: Soyuz. Spacecraft Bus: Soyuz. Spacecraft: Soyuz 7K-OK.
Titov is to tour. He will spend the next two days in Semipalatinsk, then go to Italy in the first week of June. He has been offered command of the second unit at TsPK, but says he doesn't want to be an administrator. He would rather pursue a career as a test pilot, at either OKB MiG or GNIKI VVS. Mishin is now pushing for a 1+2 Soyuz mission in August on safety grounds. He is also still pushing Khrunov as a spacecraft commander, even though Khrunov has no training in manual docking and it would take at least two months to train and qualify him. 1968 July 3 - . VPK confirms Soyuz flight plans. - . Nation: Russia. Related Persons: Belyayev, Bykovsky, Kuznetsov, Nikolai F, Leonov, Nikolayev, Popovich, Titov. Program: Soyuz. Spacecraft Bus: Soyuz. Spacecraft: Soyuz 7K-OK. The VPK confirms the Soyuz flight plan - a 0+1 mission to be followed by a 1+3 mission with crew transfer. Chiefs of the cosmonaut detachments are confirmed and announced. Nikolayev will be Deputy Chief of TsPK; Bykovsky, Commander of the First Detachment of Cosmonauts; Titov, Commander of the Second Detachment, and Popovich, Deputy Commander of the Second Detachment. Kuznetsov, Belyayev, and Leonov are not happy with these appointments. The General Staff also approves creation of a fourth training detachment at TsPK, charged with flight, engineering, and experiment development - requiring an additional 200 staff. 1968 September 20 - . Kamanin hold a cosmonaut meeting. - . Nation: Russia. Related Persons: Beregovoi, Tereshkova, Titov. Program: Lunar L1. Spacecraft Bus: Soyuz. Spacecraft: Soyuz 7K-L1. Tereshkova is having political problems. Titov is to go to Mexico, although he still is making errors of judgement which make it questionable whether he can be trusted on foreign tours. Beregovoi is to complete his cosmonaut examinations on 27 September, and then will be certified for flight. 1968 September 27 - . Cosmonauts on tour. - . Nation: Russia. Related Persons: Beregovoi, Leonov, Titov. Program: Soyuz. Titov is in Mexico, Leonov is serving on the sculpture commission for Gagarin and space monuments. Beregovoi confides to a film crew that the members of the original cosmonaut group are opposed to his making a spaceflight..
Titov in trouble - . Nation: Russia. Related Persons: Titov. There is an incident between Titov and a movie crew. This is the first such altercation he has had in three years but is still very serious..
1969 August 28 - . Titov flew the MiG-21 again today. - . Nation: Russia. Related Persons: Titov. He is flying 30 hours per month now. Kamanin finds him a fine fellow with a great zest for life..
1969 October 29 - . Titov wants out of the cosmonaut corps - . Nation: Russia. Related Persons: Titov. Titov wants out of the cosmonaut corps after hearing of his being banned from foreign travel. He is suffering a heavy penalty for his indiscretions. He has been banned from driving an automobile or flying an aircraft for two years, and lost his honoraria..
1970 April 7 - . Launch Vehicle: Spiral 50-50. Spiral spaceplane programme stalled - . Nation: Russia. Related Persons: Afanasyev, Sergei, Dementiev, Frolov, Goreglyad, Kutakhov, Mikoyan, Titov. Spacecraft Bus: Spiral 50-50. Spacecraft: Spiral OS. Kamanin reviews the Spiral manned spaceplane program with Goreglyad, Frolov, and cosmonaut Titov. Work on the KLA orbiter began in 1961-1962. In the following eight years Kamanin has tried to push the leadership many times to accelerate the project, but without result. Still, the work is proceeding, albeit very slowly. Mikoyan has decided the first phase of the project will use rocket launch only - the air-breathing winged first stage will only be introduced later. Afanasyev has finally responded to the project, only to declare that the KLA must be not only for military missions, but serve as a transport shuttle for civilian space missions as well. Dementiev is holding the whole project up because he doesn't want to overburden the aircraft design bureaux and factories. And Kutakhov won't push the program without Dementiev's support. 1970 April 27 - . Soyuz 9 book. - . Nation: Russia. Related Persons: Titov. Program: Soyuz. Flight: Soyuz 9. Kamanin works at his dacha on his proposed book on Soyuz 9 (to be ghost-written by Mikahil Debrov). Debrov will be in Japan in May, while Kamanin must go to Tyuratam for the Soyuz 9 mission. Titov is trying to get his flight ban lifted..
1970 July 27 - . Titov in trouble again. - . Nation: Russia. Related Persons: Titov. Titov has been in another automobile accident, and has again been prohibited from driving..
1970 July 31 - . Titov's privileges at risk. - . Nation: Russia. Related Persons: Titov. Spiral spaceplane project review. - . Nation: Russia. Related Persons: Dementiev, Grechko, Andrei, Krylov, Mikoyan, Titov, Zakharov. Spacecraft Bus: Spiral 50-50. Spacecraft: Spiral OS. Meeting with the Spiral spaceplane cosmonaut training group. Mikoyan and Dementiev (son of the MAP Minister) have been working on this project for four years. Many in the leadership (Grechko, Zakharov, Krylov, etc) are against the concept and hinder the project in any way the can. Grechko considers it 'a fantasy' and Kutakhov does not support it energetically. Engineer-Colonel Sokolov-Sokolenik is the head of the unit (having replaced Titov, who is now in staff school). The United States has hundreds of flights on the X-15, which they have taken to 90 km altitude and 7000 km/hour airspeed. In the Soviet Union, all such work has been frozen for a decade. 2000 September 20 - . Cosmonaut Gherman Stepanovich Titov dies at age of 65 -- Heart attack in a sauna. - . Nation: Russia. Related Persons: Titov.